He was the third son of Thomas and Emma Whitley of Alun View, Mold (later the family lived at Maes y Dre). His brother Harold was also killed in the war and he has his own page on this website. There are biographical details on Harold’s page – please follow the link. Jack’s cousin Walter Whitley was also killed in the war and he too has his own page. The niece of John Thomas and Harold Whitley, Irene Owens is a family historian with a keen interest in local history and we include below an extract from her article ‘A Milford Street Childhood’, an account of growing up in Mold in the 1940s and 50s. ‘Halfway down the street the road turned into Henffordd, a centuries old drovers’ road from early times. On this corner lived my father’s younger brother, Uncle Joe and Aunty Florrie Whitley and their two sons. Further along were the three storey houses known as Alun View where my Nain and Taid Whitley lived. On the street level was the front door and upper storey, while the kitchen and living room were reached by a side path, quite steep, called ‘the gulley’. The coal was dropped from the pavement down a chute into the kitchen which was a large room and in addition to the usual kitchen items contained a free standing bath, which had been greatly admired when first installed, very few older houses had one. We used to visit my Nain every Sunday for many years, she had a large room on the first floor and was bed ridden for a long time and was cared for devotedly by my dad’s sister Annie Edwards. Nain and Taid had lost two sons in World war One and their pictures were in her room and also the Soldiers’ Penny a memorial given to the families of fallen soldiers. 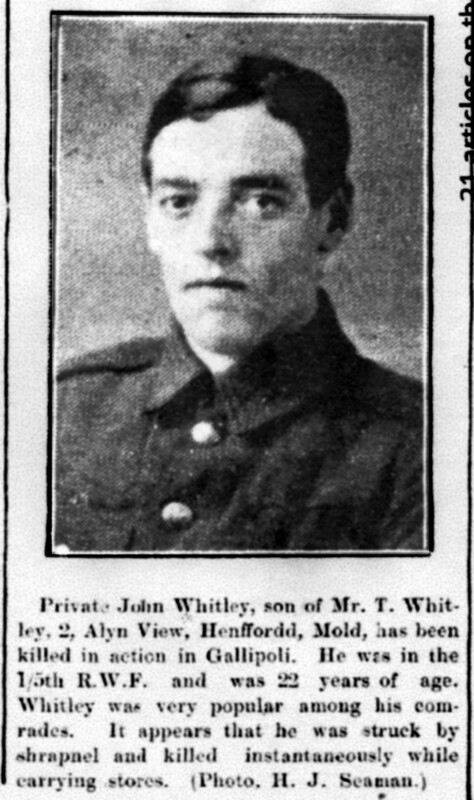 Their names are on the cenotaph at the Bailey Hill, John Whitley and Harold Whitley and their ages we were told were twenty two and nineteen. My father and another two brothers fought in that war but thankfully returned home. The eldest brother known in the family as Uncle Will had the nickname ‘Squi’ to rhyme with high. This was because when Nain had worked as a cook at Gwysaney she had been given some clothing including a deerstalker hat belonging to Squire Cook. Uncle Will tried the hat on, the name stuck and he remained as ‘Squi’ until he died in his eighties. He had been wounded in the war and walked with a limp’. We wish to record our appreciation to Rene Owens for being so generous with information about her family and for her excellent article ‘A Milford Street Childhood’. We urge her to keep writing!